The idea of using the engineering form of an I-beam for a structurally and tonally improved soundboard design has finally come to fruition for Overs Pianos, following a ten-year gestation period of the concept in the mind of its inventor, Ron Overs. The revolutionary I-rib for the Overs I-rib soundboard was developed by him over a three-month period from June to August 2003. Traditionally shaped solid soundboard ribs are prone to losing crown prematurely directly under the bridges - the region of greatest soundboard stress. This applies particularly when soundboards are manufactured using the compression crowning (CC) process. However, with the I-rib sound board the crown is formed entirely from the crown formed into the upper flange of the I-rib. There is no initial panel compression in this design since the sound board panel is of laminated 100% spruce construction. Laminated sound board panels exhibit only small width/length dimensional changes in response to variations in moisture content. The new I-rib, first used for Overs 225 pianos No. 4 and 5, is nominally 60 percent stronger directly under the bridges (when compared to a conventionally proportioned 25 x 25 mm solid section soundboard rib). The lower flange of the I-rib is tapered (narrowed) from the area directly under the bridges until the feathering point is reached. This allows for the rib to decrease gradually in strength from under the bridge to the start of the feathering. This soundboard design deflects more uniformly and less dramatically under the force of downbearing, which results in a 'cleaner' sounding piano. A close up image of an I-rib, viewed from the edge of the soundboard, is shown below. These I-ribs were manufactured using two wood species. Sitka spruce was used for the lower flange (ie. the upper flange in the image - for greater strength and central-area belly stiffness) while Tasmanian King William Pine was used for the centre web and upper flange (for improved perimeter flexibility). The Sitka spruce was chosen for the lower rib flanges following exhaustive bench stress testing. 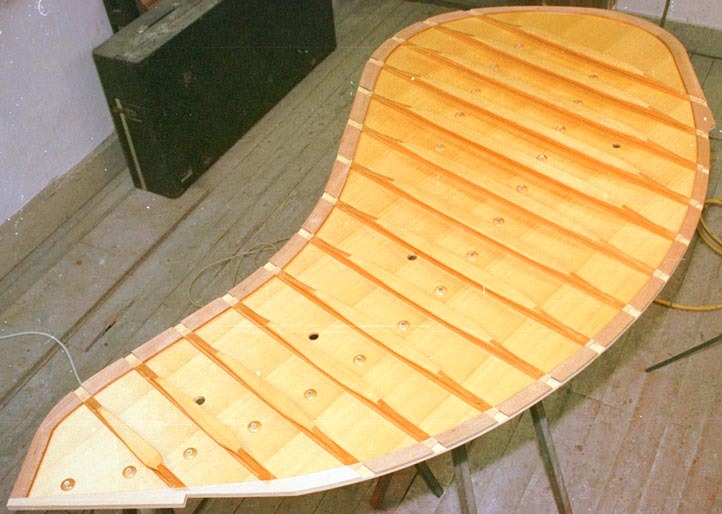 The soundboard seating area (inner rim) of the Overs grand piano is flat. The soundboard perimeter has hardwood mounting spacers glued to the sound board assembly prior to gluing the board into the case. The hardwood spacers are appropriately tapered so as to conform to the crown of the soundboard around its perimeter.